Karen Crane is an independent sideline reviewer for New Age Retailer. 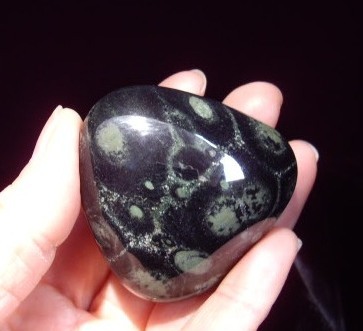 Discoverers Ron and Karen Nurnberg named it the Nebula Stone because the stone seems to connect the depths of Earth to faraway nebulae that signal the birth of new star systems. The stone has magic in it. When the box of samples arrived at my office, my assistant and I each filled our palms with the stones and began playing with them. 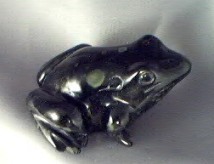 I have kept one in my pocket or clutched in my palm ever since, enjoying the grounding properties the stone seems to offer. It carries a very gentle, loving energy that makes me feel grounded on the earth and cushioned on a pillow at the same time. 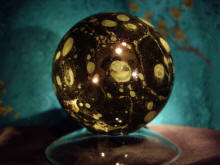 A display of various-sized pieces of NebulaStone will induce sales in your store. 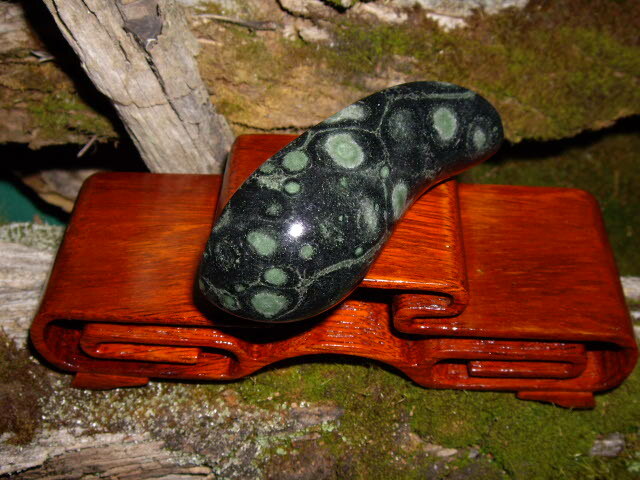 Customers sensitive to vibration will find themselves pulled to touch and hold this stone. 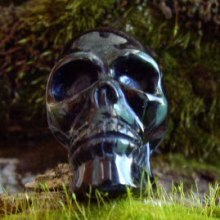 It is highly desirable for use by healers and therapists who like to place grounding objects in the hands of their clients. It can be worn as a pendant or even over the heart because it vibrates to the tone of love and won’t block the heart chakra. This stone is beautiful. 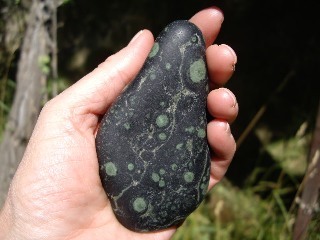 Green circles float in a field of smooth deep green almost black matrix, giving the stone a look of elegance and depth. It is offered in a highly polished form and also in a natural form that appears softly polished. It comes as tumbled stones in small sizes for pouches or pockets and also in larger pieces, excellent to use in meditation or contemplation. Prices varying depending on the size of stone and the type of finish work.